Healthier Gluten-free Dark Chocolate Chip Cinnamon Rolls made with gluten-free oat flour, almond milk and other simple ingredients! There isn’t a time that I’m not craving a cinnamon roll. ..But really. Just ask Jord who witnesses me stop and inhale the smell of Cinnabon every time we pass one in a mall or a rest stop somewhere off the highway. The smell of the fluffy buns baking with tons of cinnamon sugar is hands down one of my favorite smells in the world. Whenever I bake cinnamon rolls at home, I’m always so surprised with how close to the smell of Cinnabon they get. Which in all honesty does shock me because I’m not using probably half the amount of sugar or butter that they are using in their buns. After sharing a handful of cinnamon roll recipes this year, it was time to whip up a Healthier Gluten-free Dark Chocolate Chip Cinnamon Rolls. 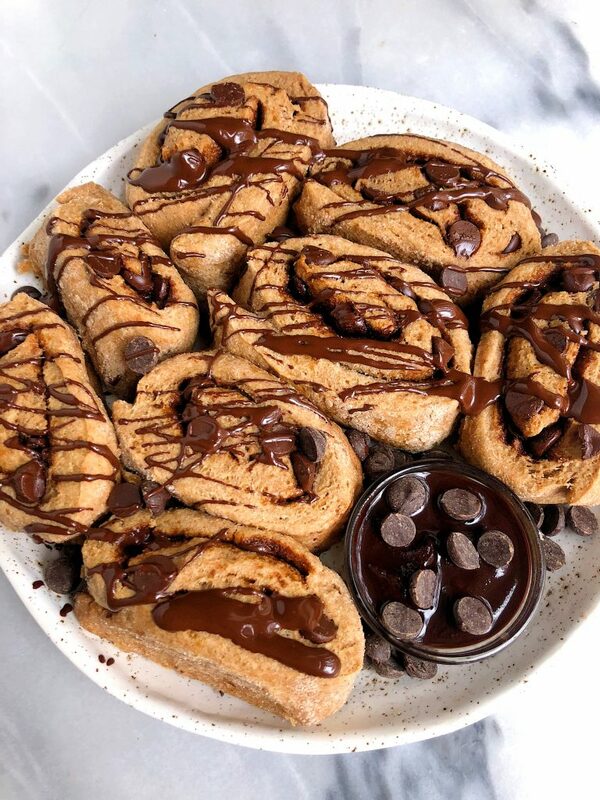 Combining two of my favorite things in the world with cinnamon rolls and dark chocolate with these fluffy gluten-free gems. 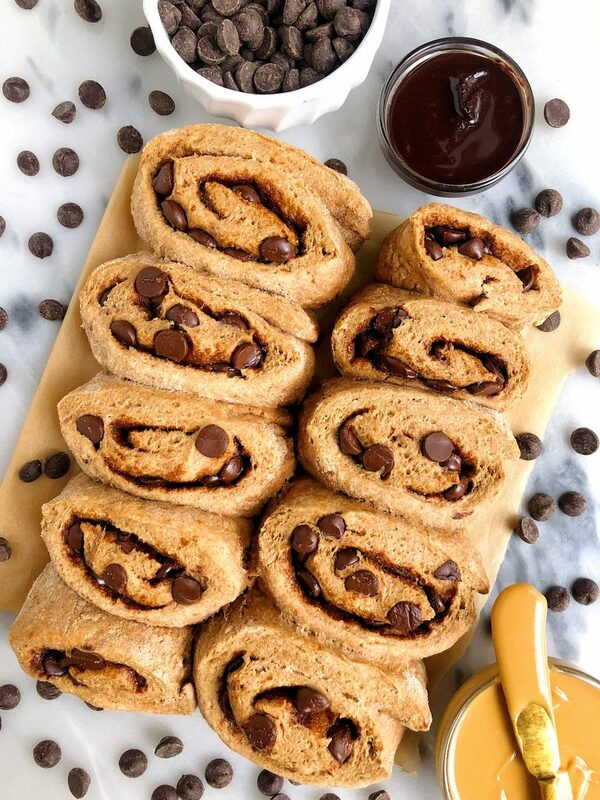 I love that these Healthier Gluten-free Dark Chocolate Chip Cinnamon Rolls are made with just a few simple ingredients like non-dairy milk, gluten-free oat flour and I use my go-to baking chocolate chips from Enjoy Life Foods for the most epic dark chocolate filling. You recently read about Enjoy Life Foods in those Peanut Butter Cookie Bars, but I love how they create allergy-friendly products for literally everyone. All of their goods are certified gluten-free and free from 14 allergens. No soy, no dairy, no nuts, no nada! Needless to say they’re dark chocolate morsels are a staple in my baking life. They also make for a mean drizzle and melt super easily in the microwave. You can also the other baking chocolates in this recipe too like the semi-sweet mini chips and chunks. Anything will taste amazing and add that sweet chocolate flavor. These Healthier Gluten-free Dark Chocolate Chip Cinnamon Rolls make for the perfect holiday breakfast recipe too. They only take 20 minutes to whip up and if you make them, there is a 99% chance my Mom will show up because she is requesting these every single time I see her now. The real cinnamon roll queen over there. 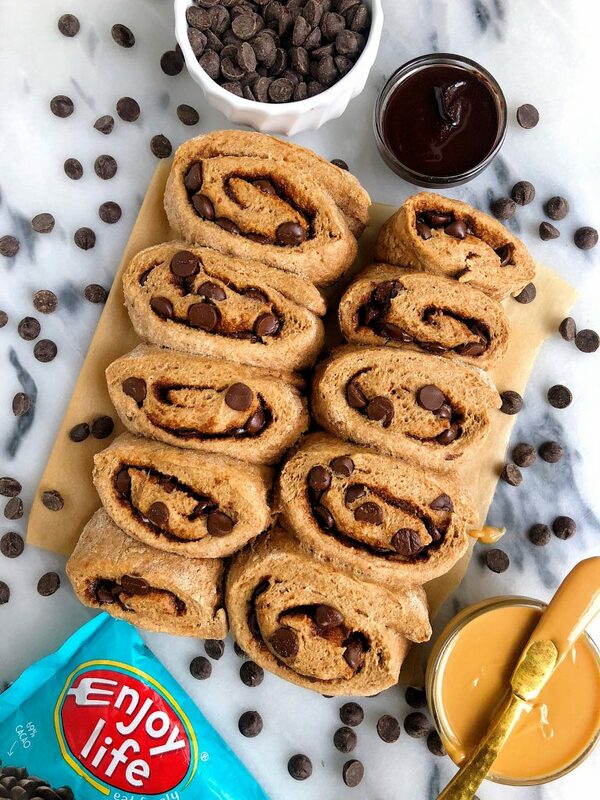 Don’t forget to share your cinnamon rolls with me on Instagram and let me know what you think of the Enjoy Life Food’s baking chocolates. I think you guys are going to love! Here are a few of my other cinnamon roll recipes from the blog: Homemade Blueberry Cinnamon Rolls, Paleo Golden Milk Cinnamon Rolls and Healthy Vegan Cinnamon Rolls. Thank you Enjoy Life Foods for sponsoring this post! It means so much to me to partner with brands I love and believe in on the blog! Can you substitute almond or coconut flour for the oat flour? i don’t recommend it! grain-free flours work very differently and the dough would be way too dense and/or wet. How do you store these? I’m the only sweets eater in My house. Counter or fridge? Thanks! Love that these use oat flour! I never find them made without GF all purpose flour! thank you! Is it best to use salted or unsalted butter for both the dough and the coating? yes, i didn’t list almond flour as a possibly flour option. it isn’t a 1:1 sub here, sorry to hear! grain-free flours cannot be subbed for grain flours, especially for the same amount.